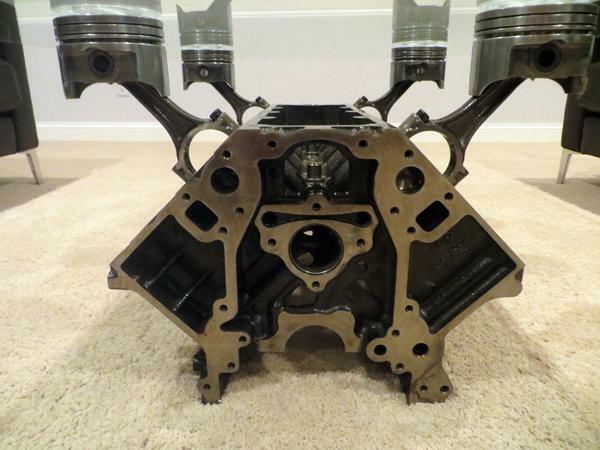 This coffee table is a new GM 4.8/5.3L cast iron block with the pistons affixed to the block, leveled, and welded in place at the heads. The entire surface area is sandblasted clean and is powdercoated in both black and a chrome-like powdercoat finish giving it an OEM style look. Finally, it is finished with a tempered piece of glass, providing you a perfect place to rest your drink! This table is made when ordered and has a lead time for 2-3 weeks plus transit.